It's not scary; it's useful. Virtual-office app Slack is adding one of its most requested features: screen sharing. And more than just simply letting a coworker look at what's on your display, you can grant control so that they can add a few lines of code, or values to a cell in a spread sheet. 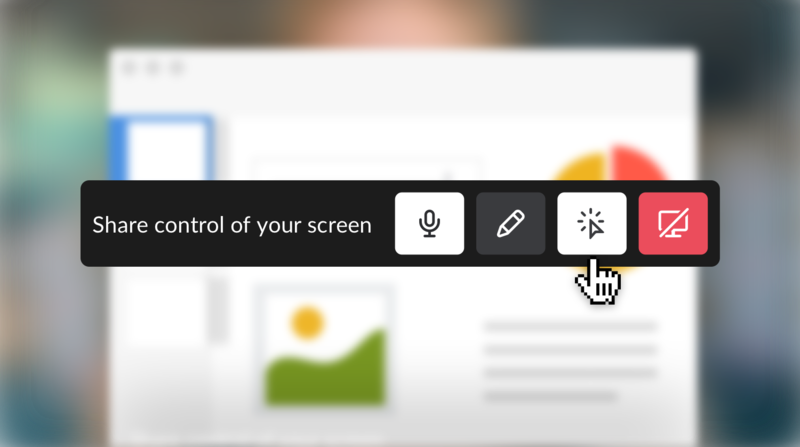 Everyone will have their own cursor for typing and clicking around, which almost makes it sound like Slack is turning your screen into a Google Doc. All thanks to the magic of the internet. Not into relinquishing full control of your machine? Your call participants can still interact, but they'll be limited to drawing on things. Still, that's pretty cool. Facebook recently added screen sharing to its Workplace desktop app, so Slack is just a touch late to this party. However, Workplace is still in a limited beta and doesn't quite have the user base that Slack does. There's also that whole deal where Slack is basically becoming the last work chat app you'll need. What with it adding integrations and features that used to require myriad logins to various disparate services like Join.Me for sharing a screen with multiple remote people, and all. That's to say nothing of how consistently easy it is to use the new collaboration tools. If you're just using the app to chat with friends on a private channel, the new functionality won't be available to you; a post on Medium says that you'll need to be a paid subscriber to access it.